Honoring Our DKG Heritage: Beta Upsilon Chapter was founded November 8, 1980, sponsored by Alpha Theta Chapter, Helen Jasper Roos and Margery Phillips. From our beginning as a chapter, we had a large number of State officers and committee people...Our second meeting was our first Christmas party, held at the home of Freida Slattery....At the April meeting, we finally settled on the place to hold our meetings - St. Dunstan's Episcopal Church, where we had been organized. Our guest speaker explained the Rachel Royston Permanent Scholarship Foundation. At the May meeting, we decided to give a grant-in-aid to a deserving senior girl. 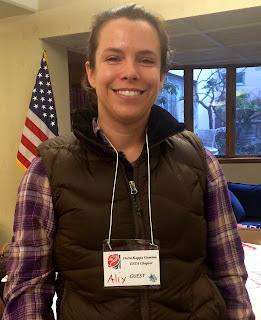 Our first grant-in-aid was $50. It left us a balance of $41.96. We were busy the next year - we started the traveling gift idea, and the progressive auction of a lovely painting by guest, Frieda Kurth. Proceeds of the auction went toward scholarship and grant-in-aid funds....Our grant-in-aid was raised to $75....Our rummage sales have been highly successful in raising money for grants-in-aid and officer expenses. The grant-in-aid is now $500. Josie B. Esau served as a member of the Rules Committee for International Convention in Atlanta. While there, she was asked by the new International President, Gloria Little, to serve on the Constitution Committee of International...Carol Selle attended the International convention in Baltimore and presented a workshop on Cooperative Learning. In 1989, she was elected State Second Vice-President. (from Golden Anniversary of Alpha Sigma State 1941-1991). On Tuesday evening, February 20, 2018, I had the pleasure of joining fourteen dynamic of women of Beta Upsilon who braved the wintry night chill to enjoy a Chinese meal at the Siam Restaurant in Grand Coulee, WA. The 6 pm meeting began with introductions of three prospective members, and special recognition of Beta Upsilon member Jessica Tufts for being selected as the 2018 State RRPSF Margaret L. Harvin Scholarship Award recipient. Through the CARE💙NET Earn While You Learn program, the mommies are able to earn points by completing a variety of educational materials. The points can then be spent in the center's Baby Boutique, which is filled with everyday items needed for their baby. Inspired by this point system, Beta Upsilon seeks to partner with the center to provide a literary program (books, videos, curriculum etc.) to help these young women learn about the importance of reading to their young children. Twenty-four gently loved purses & bags were filled to the brim with personal hygiene products and letters of hope. 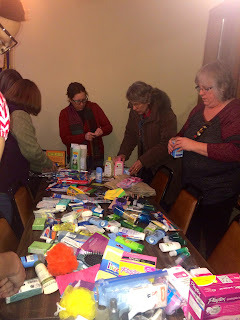 The women were excited to work on this project and look forward to donating the purses to women in need at a local shelter and Chapter President Caryn Mills will bring at least one purse donation to the state convention in April. Many thanks to the Beta Upsilon Chapter for the wonderful fellowship and laughter, for providing my Chinese Siam special dinner, to Joyce Moore for her special gift of yummy homemade raspberry jam, and to Lisa Wiese for serving as my B & B hostess. 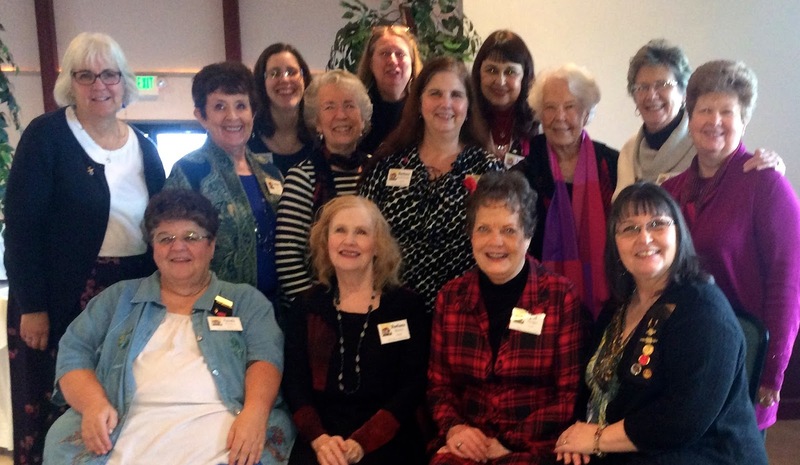 Honoring Our DKG Heritage: Through the years, many members have provided outstanding programs including patriotic, innovative teaching methods, and teaching experiences in foreign countries. Zeta has had teas and salad luncheons to raise funds for various scholarships. Some of the members have been recipients of these scholarships for doctoral degrees and credentials for school administration. Fifty-one qualified local high school women graduates have been assisted in becoming teachers throughout the chapter's Ruby Long Recruitment Grants program since 1947....A Centennial Tea was a culminating event, co-sponsored by Chelan-Douglas RetiredTeachers Association and Zeta Chapter. Over two hundred fifty people gathered at North Central Washington Museum in Wenatchee, October 26, 1989 to honor thirty-one teachers who had taught in one-teacher schools in Chelan and Douglas counties. Thirty-one former students who had attended one-teacher schools were registered also. After the tea, a slide show of school buildings, teachers and pupils of one-teacher schools was presented. (from Golden Anniversary of Alpha Sigma State 1941-1991). I had a beautiful drive to Wenatchee on Tuesday, February 13, 2018. The sun was shining, little traffic on the road, and since my husband drove this time around, I had a relaxing ride to boot! Zeta's chapter meeting was scheduled from 5 - 7pm. These dynamic women are so gracious and have collaborated to develop delightful, workable and creative fundraising ideas. I arrived at the First United Methodist Church a wee bit early, and as I entered, I was immediately welcomed by the wafting aroma of four yummy homemade soups simmering for our evening meal served with a simple Cesaer salad, a roll and cupcake for dessert. Each month the hostess committee plans a different meal...Next month it's a baked potato bar with all the sorts of toppings....Can you say "Scrumptious! " Members agreed to each pay $10 for the delicious monthly meals, which helps to provide monies for their special chapter projects. Valentine decor adorned tables, but my eye was drawn to the beautiful themed raffle basket for raising scholarship/grant-in-aid funds....3 tickets for $1...I bought $4 worth. Another fun opportunity to raise contributions for their Literacy Council, as well as to honor members' birthdays, is to collect 25 cents for each member whose birthday is that month. Now, it is an optional donation, but I observed most everyone put their pennies in the pot. Two members had birthdays, so each member who wanted to, donated 50 cents...A great and easy idea! Zeta Chapter has a long-time fundraising partnership with the Manson Casino. Each month, if at least 15 members/guests sign up to go to the venue, the casino will give each person $10 to play and $5 for food. At the end of the evening, the casino awards Zeta Chapter $10 per person just for participating. This is one of the easiest fundraisers ever! I was so very impressed with the evening's presenter Alix Whitener, daughter of Zeta member Chris Crilly. 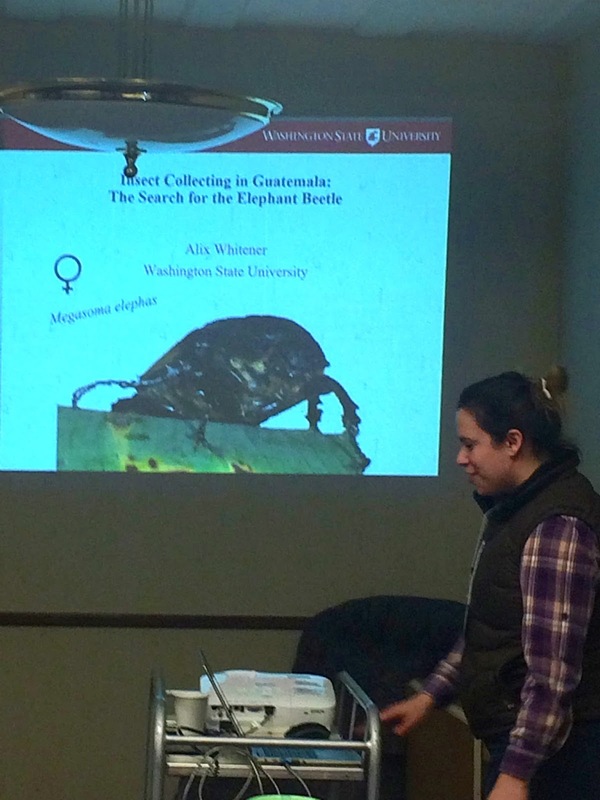 Alix is a PhD candidate studying tree fruit entomology and on March 26 she will present her dissertation at WSU. Using a power point presentation on "Insect Collecting in Guatemala - The Search for the Elephant Beetle," she described how, from an early age, her elementary teachers (some of whom are DKG members) helped to foster her love of entomology. She went absolutely BUGGY about bugs! One could definitely admire the passion and commitment she has for these wee creatures as Alix described her trek throughout the tropical forests of Guatemala collecting a plethora of insects. In my book, she has definitely earned the title of Wonder Woman!! At the end of the meeting I had the opportunity to thank the Zeta members for their hospitality, and I shared information about the upcoming Quadrant 2 Technology & Learning workshop in Spokane, and highlighted the State Convention in April 27-28 in Olympia. I hope to see many of these wonderful women at these events. And by the way...it was my lucky night...I WON the raffle basket! The next morning, we left Wenatchee's sunshine, and my husband and I journeyed back to Spokane...This time into another round of Winter Wonderland. I am ready for spring's sunshine to stay! Area IV Fellowship Brunch "A Book Opens Up the World ~ Lending Libraries"
Driving over the snow-laden road of Snoqualamie Pass in February is not my cup-o-tea...Ol' Man Winter is still alive and well, so on Friday, February 2, 2018 I boarded Alaska Air and flew the friendly skies to Seattle to attend the Area IV Fellowship Brunch at the lovely High Cedars Golf Course in Orting, WA. 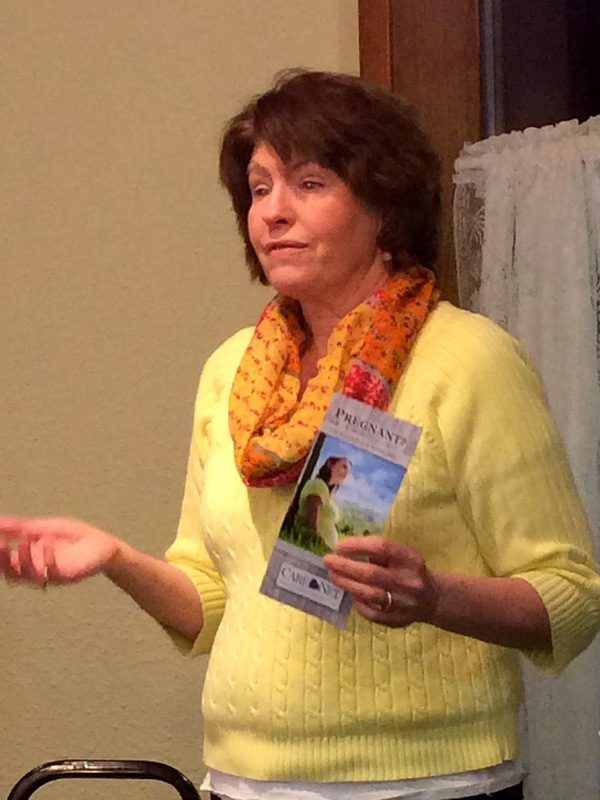 Kappa Chapter member Jeri Senger, my trusty uber driver and B& B hostess, met me at the airport and scooped me away. DKG women are such a joy to spend time with. That evening I joined Jeri and ten of her "besties" (many of whom are educators) for a rousing evening of BUNCO! What did they all say say to me? "The newbie always is the winner! "...Well, they were right. I did win! Unbelievable! This group of women inspired me with their antics and stories, and now I must bring BUNCO to my Eta Chapter in Spokane for a fun evening of fellowship, too! When it was time to leave, of course, the car battery was dead as a door-nail! But never fear, women educators are always prepared! Of course, jumper cables and a little teamwork did the trick and we were on the road again! On Saturday morning, February 3, Jeri & I dashed out to the Cedars Golf Course for the Area IV Brunch I was so very excited to see nearly 60 members from Alpha, Epsilon, Kappa, Alpha Tau, Beta Delta, and Alpha Rho Chapters in attendance. 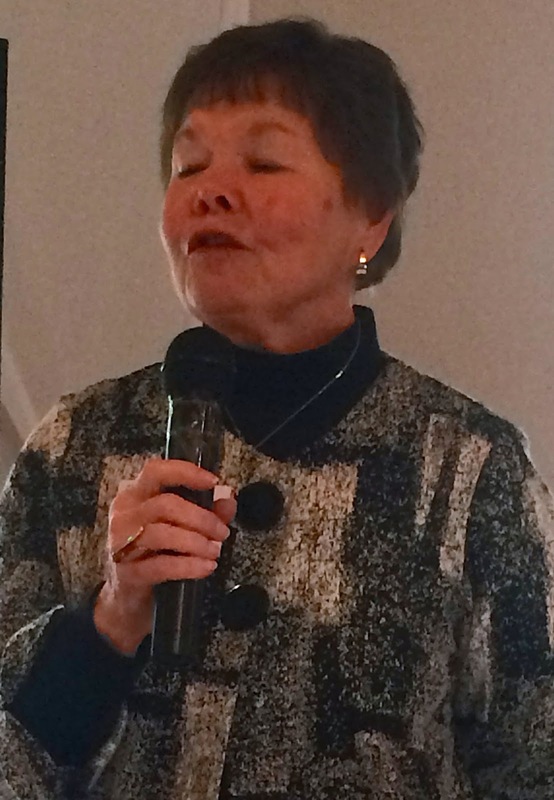 We enjoyed a wonderfully prepared brunch buffet meal, were entertained by the Tapestry Singers (the Puyallup community choir), and listened to guest speaker DKG member Roberta Brudevold share her passion to provide low-income children with books to read at home. Two years ago, Brudevold founded the K-3 In-Classroom Lending Library, a non-profit organization whose aim is to ensure that all children are provided with the right to learn. 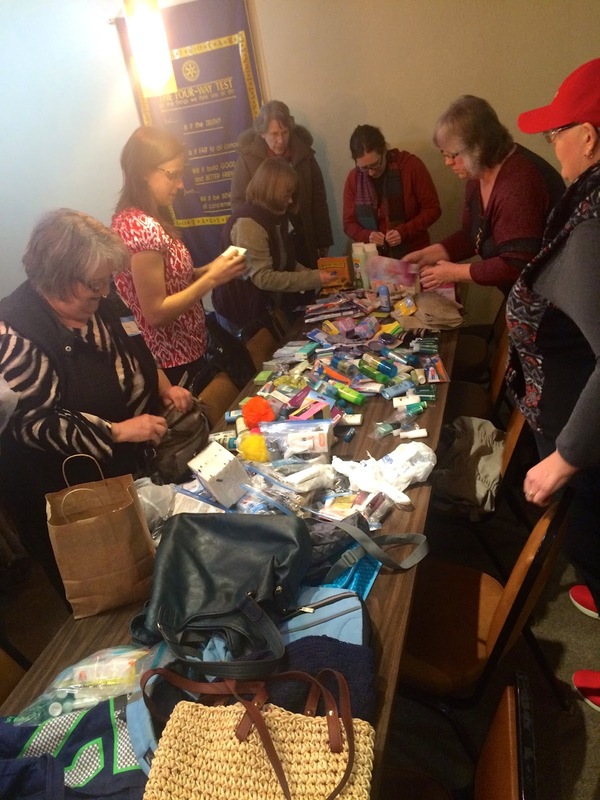 Volunteers collect, organize, and donate books to the Puyallup School District classrooms with children who may not be able to afford them. They help teachers build the "just-right" classroom library. The donated books are delivered directly to the schools to help children build skills, confidence, and discover the enjoyment of reading. Each classroom is presented with at least thirty windows of the world. The participating teacher labels a bag with a student's name and places a book inside to take home. When the child is done reading the book, they return it to school before they can take another. I am very fortunate to be a part of this excellent organization to network with these dynamic and passionate women. I look forward to seeing them again soon & encourage each to attend the upcoming DKG spring convention at the Red Lion Hotel Olympia on April 27 - 28, 2018. When all was done, I jetted off again toward home...I am looking forward to my next DKG journey! Thanks to all for an extraordinary day!